Enjoy Utah! 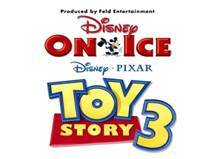 : Disney On Ice: Toy Story 3 BOOK DRIVE and FREE Tickets! Disney On Ice: Toy Story 3 BOOK DRIVE and FREE Tickets! ARE KICKING OFF SALT LAKE CITY'S FIRST "HOEDOWN SHOWDOWN BOOK DRIVE"
Everybody's favorite toys are back in Salt Lake City with Disney On Ice presents Disney/Pixar's Toy Story 3 and this time they are making sure "no book is left behind" as they round up the Salt Lake community to benefit Road To Success in a fun-filled "Hoedown Showdown Book Drive." Buzz and Woody invite you to collect books for low-income families and pre-schools throughout Salt Lake City. The first 500 people to bring a new or gently used children's book, to the EnergySolutions Arena Plaza Door Six to donate to the Road to Success Organization. ­­­ In appreciation for every book donation, each person will receive a free ticket* to the opening night performance of Disney On Ice presents Disney/Pixar's Toy Story 3 playing at EnergySolutions Arena - March 7-11, 2012. Poverty has a profound impact on literacy development and a good book can be a good friend, that's why Disney On Ice supports literacy in an effort to help provide the fundamental skills required for learning how to read. The Road to Success collects, repairs, and packages used books, which are then made available to families in need - free of charge. Excitement about reading books can be contagious, so donate your new or gently used children's books to local underserved children! Inspired by the #1 animated movie of all time, Toy Story 3, and memorable moments from Toy Story and Toy Story 2, everyone's favorite characters are hitting the ice in the sensational live production, Disney On Ice presents Disney/Pixar's Toy Story 3, coming to Salt Lake City at the EnergySolutions Arena for nine performances from March 7-11, 2012. Feld Entertainment is the worldwide leader in producing and presenting live touring family entertainment experiences that lift the human spirit and create incredible memories, with 30 million people in attendance at its shows each year. Feld Entertainment's productions have appeared in more than 70 countries on six continents and include Ringling Bros. and Barnum & Bailey®, Feld Motor Sports, Disney On Ice and Disney Live! For more information, please visit www.DisneyOnIce.com or look for us on Facebook and YouTube. There are always catches to these things, like "one ticket per family" or "must be so old to participate". I notice there is an "*" next to "free ticket", but don't see what it is supposed to mean. So, what's the catch? I would like full details before I get my and my children's hopes up and then don't get what I expect. - One person can't bring 20 books and expect to get 20 tickets. Each person getting a free ticket must be present a bring books. - You are given a voucher that you then take to the box office to pick out where you want to sit, and what showing you want to attend. They are usually good for any showing Wed and Thrs, and matinee on Friday. Ill give em 10 books Just want 5. They said they would give out 1 book per person per book.